Spice Shop - Buy Spice Tins Here! We’re out of spice tins! Unfortunately we are no longer selling spice tins but we do have an assortment of ‘seconds’ that are very lightly dented and are up for grabs at half price! An Indian cook handles a spice tin like an artist's palette. The seven spices contained in it can be combined in an infinite variety of ways to produce the complex, multi-layered flavours of Indian cuisine. Hand crafted in a gorgeous self embossed design, eye catching and sturdy, this spice tin will soon become a valued heirloom in your family. 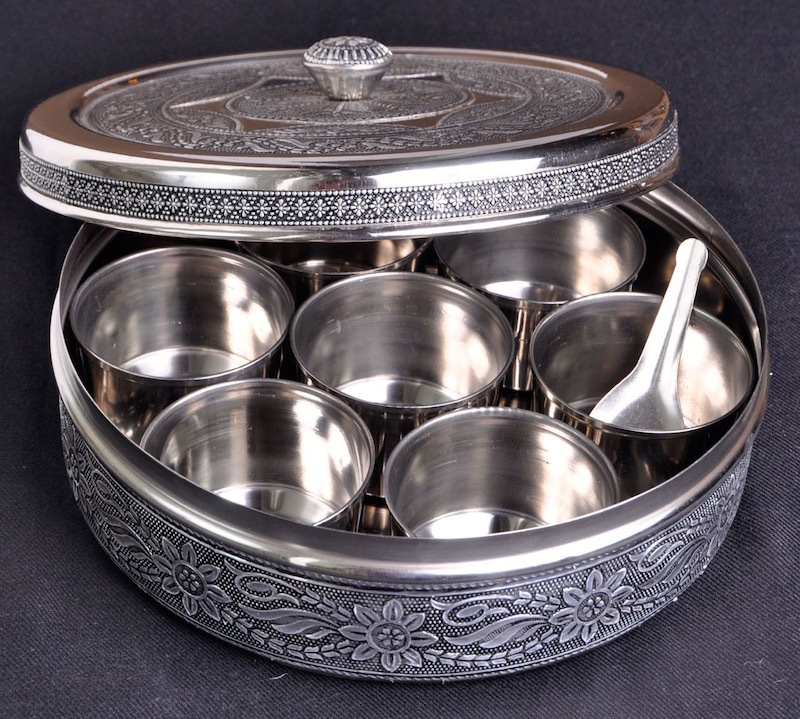 Now you too can create authentic, delicious Indian foods in your own kitchen when you purchase this beautiful spice tin. Embark on a culinary journey that will transform your cooking forever! Smita's Spice tins make perfect gifts for anyone who loves to cook! A large spice tin, made of high quality stainless steel with hand carved borders and edging. Dimensions: 8 inches in diameter, 3 inches high, with 1 lid, 7 small inner tins and a small spoon. Ideal for storing spices, both ground and whole. Store in a cool, dry place. Hand wash when necessary. Note: In order to avoid spilling spices when opening the tin, it is preferable to open the lid from the edges rather than pulling the knob at the top. I now have the essential spices to complete my kitchen, the tin is absolutely stunning and all the spices are fresh and very aromatic. I LOVE my spice tin!! Thank you Smita for putting all the necessary spices together in one place! I received my package very promptly by courier...and I am delighted with the tin and the spices! I have already made a chicken curry and my family just loved it. I am such an amateur cook, but you have made me look really good! Thank you! 'Tin' seems an inadequate word to describe this! It is very lovely, heavier than I thought it would be and will look great in my kitchen. I had the pleasure of taking a cooking course with Smita and was truly inspired by her love of Indian cooking and her willingness and desire to share her passion with others. I just received my spices and the beautiful tins and cannot wait to put them to good use by making even more of Smita’s recipes!